Professor Ian Campbell is a Professor at Loughborough University, which is pioneering the field of design for additive manufacturing research. With an extensive background in design engineering, Professor Campbell has published over forty academic journal articles, is the editor of Rapid Prototyping Journal and has been an Associate Consultant for Wohlers Associates since 2014. We were pleased to be able to sit down with Professor Campbell and discuss the importance of design for additive manufacturing, the role of automation in AM and how mass customisation and hybrid manufacturing could transform industries. Q: How did you first become involved in AM? I was doing a Masters’ degree at Warwick University in 1993 when I first became aware of stereolithography, but it was only when I moved to Nottingham University later that year that I had access to the university’s stereolithography machine, and I started research on my PhD, which focused on the link between design and, as we called it then, rapid prototyping. My premise at the time was that rapid prototyping would become a production process — which people couldn’t really envisage in the 1990s. But I did, and thought that if rapid prototyping was going to turn into a production process, we would have to learn how to design for it. And that’s what my PhD focused on. Q: Ironically, today design for additive manufacturing is a huge talking point. Where are we with that, and what progress needs to be made? I think it’s a bit haphazard at the moment. 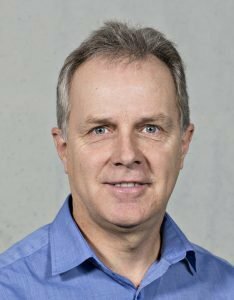 There are certainly pockets of expertise in certain companies, with some designers really understanding the possibilities of additive manufacturing in terms of lightweighting, complex internal structures or using topology optimisation and so on — and this is especially the case with aerospace companies. But having said that, on the whole, I think there is a bit of a knowledge gap within our design community, with a lot of designers who perhaps don’t understand additive manufacturing well enough or haven’t been given the opportunity to think about how it could change the way they design. This may be changing with the new generation of designers coming through university who are now receiving that education. But for designers who have been practising for a while, unless they’ve had to come face-to-face with using additive manufacturing as a manufacturing process, they probably haven’t thought about the benefits it could give them. So I think there’s definitely an opportunity to drive that forward, and that’s one of the things we’re trying to achieve with the new Masters’ programme we’ve launched. Q: Where do you see design for AM in five years? Firstly, I believe we will see more people recognising its potential as a production process, and therefore having to learn how to design for it, especially with the new generation of designers, many of whom will have been made aware of additive manufacturing. Another thing I’m expecting to happen is greater design automation and the emergence of more specialised tools to help designers do some of the clever things that are needed to take full advantage of AM. Now some of these tools do exist already, like topological optimisation for example. And I know that there is other software that aims to develop internal lattice structures automatically so that there is no need for someone to have to sit and create those on CAD themselves. Additive manufacturing can do some incredible things in terms of creating complex geometries, but to expect one person or even a team of people to sit down and create those sorts of geometry would create a real bottleneck if it was all being done using conventional tools. Ultimately, I think there has to be a greater range of tools available to automate some of the processes that we would need to follow. Q: Automation is a key trend in AM right now. How do you see automation evolving for AM? Right now, there are quite a lot of processes that intensively make use of human labour within AM. Automation can help in a lot of ways — it could be as simple as deciding where parts are going to go on the build platform using automation software, or calculating the build time automatically. We could even automate the simulation of the surface finish that will be created depending on the orientation that you use. I can also imagine using automation to choose the correct parameters for running the machine, rather than doing a trial and error with different parameters. In this regard, there will be more feedback loops within the additive manufacturing systems which will help us to improve quality during the build as well. And as far as design is concerned, I’ve recently seen some interesting software that enables you to input the hard points of the design (the points where your component must touch other components) into your CAD system in addition to the forces that will be exerted on your component, so that the geometry is automatically grown. So it’s not like topological optimisation which takes material away — although that’s pretty interesting in and of itself — this actually involves growing the part using automated software. Overall, I believe there’s great scope for further automation right through the whole value chain, from when we’ve got an idea of what our product is going to look like right through to getting the finished parts off the machine. Q: You’re currently leading a research project on customisation for the automotive industry. Could you tell me more? The aim of the project is to work with our partners in Romania to identify a number of research areas, one of which is in the design and use of customised parts to be used by a number of automotive component suppliers. We’ve run a couple of pilot studies where we think design and customisation could help the automotive industry, whether it be in the more functional parts, like customising the suspension for different driving styles, or on the more aesthetic side, where you customise things like the handle on your gear change lever, the shape of your steering wheel or even some of the control aspects used on your dashboard. Those are just some of the areas we’re looking at. Q: What are you hoping to achieve from the pilot studies? What we’d love to see from these pilot studies — and we’ve already started some of the development work on this ourselves — are mass customisation toolkits, where you can take a fully standard product and tweak some of the parameters to transform it into a customised product. We’re not the only ones to do this — one example being the Nervous System which is mainly aimed at jewellery, you can take a fully standard design, play around with different parameters to change the shape and then 3D print your own version. We’ve been doing studies into the different kinds of interfaces that people like to use, the number of parameters they can handle in terms of varying their design and also how much value can be added to a product when we allow somebody to do some of the customisation for themselves. Ultimately, we want to get to the stage where we can find the best way of designing a mass customisation toolkit. This would start with the designer doing some work to create a standard or even an unfinished design. But then we envisage the customer coming along and finishing that design off for themselves. So it becomes a form of co-created design, where there’s been input from the manufacturer or design house as well as input from the end user as well. Q: Do you see this form of “co-creation” as something that will become more commonplace in 3D printing in the future? It’s already happening to a certain extent. For example, Mini already allows you to choose customised products. But in terms of actually changing the shape of the product, which is what we’re exploring, there’s not really much happening on this front, particularly with functional products. And in industries like automotive, you have to ensure that if you do allow your customer to make changes to the shape then the product is still safe, functional and economic to produce. A lot more research needs to be done in this regard before companies will be prepared to allow users to customise their products — and in some cases, certain companies may never allow users to customise their designs. But we’ve talked to other companies that would be prepared to allow some degree of variation to be brought in by their end users. If I take the example of a hair dryer: customisation could be as simple as making the handle grip of the hair dryer fit a particular size of hand. You could even create your a style of hair dryer that could in some way have some of your own personal characteristics embedded within the product. And that’s another area of research we’re exploring — we think that if people engage in this sort of co-design they may build up an emotional attachment to the product. This means that they may be prepared to pay a bit more money for it and also hold onto it for a bit longer, so we don’t end up throwing so much away into landfill. This is another aspect of our research at Loughborough —sustainable design. Q: Loughborough University is pioneering what it calls “hybrid and multi-systems AM”. Can you explain what this means? When we talk about hybrid, we’re referring to the integrated combination of additive and subtractive manufacturing within the same machine. At Loughborough, we’re looking both at metal systems and polymer systems. Q: How does this hybrid manufacturing approach work for metal systems? For metal systems, there are already some machines available from companies like Matsuura and DMG Mori — they’ve created machines that will add some material through a type of deposition process and then do a tool change. So instead of having a deposition head, you bring in a CNC milling tool which will remove some of the material, either to give you a better surface finish or to improve the accuracy of some of the features. Once that’s done you may do another tool change and go back to the additive process and add on some material to cover over the area you’ve just worked on. And you can switch between the two as often as you like. What this means is that you can get all the geometric freedom of additive manufacturing, but if you do have a need for higher accuracy or a better surface finish (which is often the case for engineering components) this can be achieved not just on the exterior but even on the interior surfaces that would not be accessible if you built the whole thing in one go. We think that this will open up new possibilities for one-stop production where you have one machine, can download the CAD part and you end up with a finished part from that machine with no further machining required. This type of metal hybrid manufacturing will be very useful for highly engineered components, as it will enable you to reduce the number of components you need to put into your system, therefore cutting your assembly costs and reducing the amount of material you need. This is particularly important in aerospace applications because saving even just a couple of kilograms can greatly reduce your fuel bill. Q: Is the hybrid manufacturing process for polymers quite different then? The process will actually be quite similar, in that it will use deposition followed by machining. The difference is that for polymers everything happens at a much lower temperature. What we’re aiming to do here is to bring greater geometric freedom and accuracy to AM polymer parts whilst also keeping the costs down. So while the driver on the metal side is more about high end engineering products, on the polymer side, it’s more for everyday use products. Q: What other research projects are on the horizon at Loughborough University? Well, we’re also looking at some additive manufacturing of composite materials. What we aim to do here is control the directionality of the fibres within composite parts to make them stronger, stiffer, or lighter or other engineering benefits. That’s just recently kicked off, and involves a number of international partners. Q: Can you tell us a bit more about the new Masters’ programme at Loughborough University? It’s called Design for Additive Manufacture, and runs for a year, in three semesters. We take students through what additive manufacturing is and run through some of its singularities and benefits. There is a minor project looking at how we can redesign for additive manufacturing, followed by a major project which involves designing a product from scratch and redesigning it. We also take a look at some of the higher level computer aided design tools that fit in well with additive manufacturing, such as topological optimisation as well as some of the different types of modelling that are available, such as voxel modelling — so looking at a different way of working inside CAD. Q: Finally, what’s the next trend in AM that you’re most excited about? One thing that is really exciting is that machines are getting bigger, which means that the range of applications is growing. At one time when you thought of additive manufacturing you’d be thinking of parts that fit within a half metre cube, but that’s changing quite rapidly now. We can see this in architectural applications of additive manufacturing, where we can begin to create things like houses. But more typically you can begin to create some interesting structures to go within buildings. We can also see this impact in aerospace, with large aircraft parts being built on these large machines. Another trend that has been around for a while is the idea of creating metamaterials, whereby you can make your material behave differently by playing with geometry. For example, you can create what’s called an auxetic structure, where normally when we push on a part and squeeze it in one direction it expands in the other directions, for example when you squeeze a ball in the vertical direction, it will expand in the horizontal direction. But using additive manufacturing and some very clever design, it’s possible to create structures where if you squeeze them in the vertical direction, they will shrink in the horizontal direction as well. It’s a very clever use of complex geometry. People are also looking at other aspects, like creating parts that will have a different reaction to thermal gradients. With 4D printing, for example, you can potentially create a part that can change its shape or expands after you heat it up. So if you were to create something to send to space in a ball, once the heat of the sun hits it, it could theoretically open up to some sort of antenna. So being able to get materials to act differently because of the complex geometry that you’re building into parts is really exciting — and means that we’re not just dealing with a lump of material, but with smart material. Click here to learn more about the Additive Manufacturing Research Group (AMRG) at Loughborough University. Check out our recent interview with Dr Richard Buswell of Loughborough University.